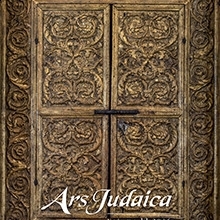 Ars Judaica is an annual peer-reviewed publication on Jewish visual culture. It showcases the Jewish contribution to the visual arts and architecture from antiquity to the present from a variety of perspectives, including history, iconography, semiotics, psychology, sociology, and folklore. As such it is a valuable resource for art historians, collectors, curators, and all those interested in the visual arts. Volumes of Ars Judaica are distributed by the Littman Library of Jewish Civilization throughout the world, except Israel. Ilia Rodov, Chair of the Department of Jewish Art at Bar-Ilan University. He is the author of many works on European synagogue art, focusing on the history, patronage, and meanings of synagogue paintings, sculptures, architectural decoration, and furniture design. Mirjam Rajner, Senior Lecturer in the Jewish Art Department at Bar-Ilan University. Her numerous publications deal with the early art of Marc Chagall, the art of Russian, Polish, and South-Eastern artists of Jewish origin in the nineteenth and early-twentieth centuries, and the art created during and immediately after the Holocaust. Emile G.L. Schrijver is General Director of the Jewish Historical Museum and the Jewish Cultural Quarter in Amsterdam, as well Professor of Jewish Book History at the University of Amsterdam. He has served as curator of the Bibliotheca Rosenthaliana at the Special Collections of the University of Amsterdam for many years and was the Sigi Feigel guest professor of Jewish Studies at the universities of Zurich and Basle, Switzerland. Prof. Schrijver is an expert of Jewish cultural history and Jewish book history, who has published and lectured extensively in Europe, Israel and North America. Publication of an article in an academic peer-reviewed journal such as Ars Judaica serves several functions, one of which is to validate and preserve the "minutes" of research. It is therefore of immense importance that these "minutes" are accurate and trustworthy. The act of publishing involves many parties, each of which plays an important role in achieving these aims. Ars Judaica maintains that the author, the journal editors, the peer-reviewer, and the publisher have responsibilities to meet expected ethical standards at all stages in their involvement from submission to publication of an article. Ars Judaica is committed to meeting and upholding standards of ethical behaviour at all stages of the publication process. We strive to closely follow the high standards found in The Publishing Ethics Resource Kit (PERK), an online resource to support journal editors in handling publishing ethics allegations. We consider the guidelines produced by industry associations, such as the Committee on Publication Ethics (COPE), to be models for best practices in order to meet these requirements, and authoritative concerning disputed cases. Below is a summary of our key expectations of editors, peer-reviewers, and authors. To be aware of any potential conflicts of interest (financial, institutional, collaborative or other relationships between the reviewer and author) and to alert the editor to these, withdrawing their services for that manuscript if necessary. Ars Judaica and Bar-Ilan University shall ensure that good practice is maintained to the standards outlined above. Ars Judaica and Bar-Ilan University provide assurance that they subscribe to the principles outlined above and strive to bring them to the attention of the editors and editorial boards, reviewers and contributors. Serious misconduct might require that the employers of the accused be notified. The editor, in consultation with the publisher or Bar-Ilan University as appropriate, should make the decision whether or not to involve the employers, either by examining the available evidence themselves or by further consultation with a limited number of experts.